The beautifully preserved remains of an Iron Age broch stand in a superb position overlooking the sea, with views of nearby Dunrobin Castle. The broch still stands to the level of the first floor, and in the field below you can easily discern the outline of a settlement. 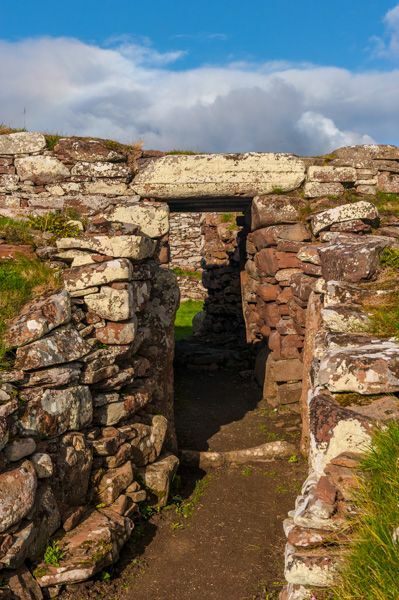 Carn Liath cannot be dated precisely, but the golden age of broch building in northern Scotland stretched from roughly 300 BC to 200 AD. 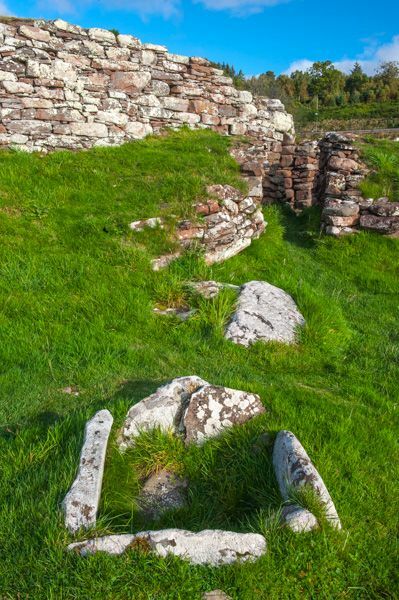 Like many brochs, Carn Liath was not a solitary fortress, but the centre of a community. At the centre of the site is the circular stone broch, now standing to a height of 3 metres, but originally 3 times that height. 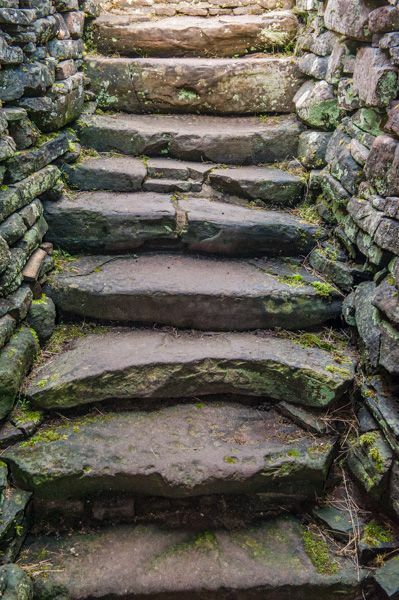 The thick stone walls were made wide enough to accommodate chambers and passages linked by stairs. 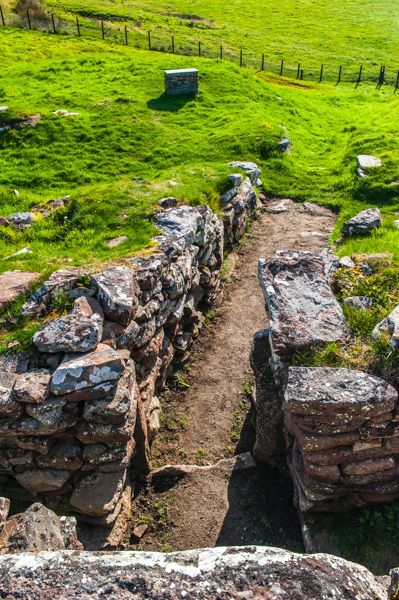 Even by the standards of Sutherland brochs, the walls at Carn Liath are exceptionally thick. The long entrance passage has notches for a pair of doors, which would have been strengthened with sliding wooden bars. There is a small chamber leading off the entrance passage, much like the guardroom of a medieval castle gatehouse. Opposite the entrance is a second doorway giving access to stairs within the thickness of the wall. 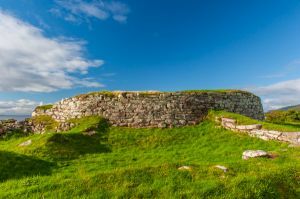 The broch is set on a raised mound, similar to a medieval motte. 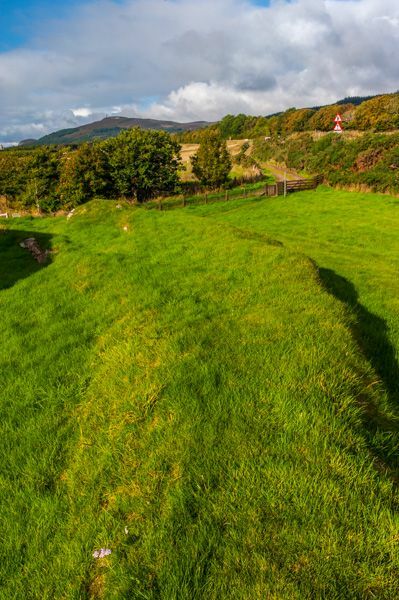 It seems likely that the mound was shaped to make the sides steeper in places, enhancing its defensive character. Below the broch, within an earthwork enclosure, are the remains of huts, indicating a sizeable community. Excavations within the broch revealed three rounded stone chambers sunk beneath ground level. Iron slag was discovered, suggesting that iron was worked here, and other finds include rings and beads made of local shale. 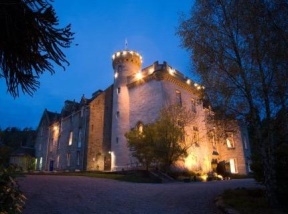 There are remains of hut circles on the wooded slopes above the broch (in Dunrobin Wood) and from the broch walls you can see the superb Victorian mansion of Dunrobin Castle, the seat of the Dukes of Sutherland. There is a signed parking area on the west side of the A9, 3 miles north of Golspie. From the parking area, a path leads to a road crossing. You do have to be careful crossing the road, as the traffic can be whizzing along at a great speed in both directions. From the east side of the road a trail leads back north to the broch, standing in a fenced field. There is a signpost inside the field entrance that helps give a better idea of the history of the site and how the broch was built and lived in. I've had the pleasure of visiting Carn Liath twice. It really is enormously impressive. You can (carefully) climb the stone steps within the thickness of the walls to reach the top of the wall surface. From that vantage point it is easy to see how the broch was laid out and how it was linked to a large number of secondary buildings surrounding it. The location is simply wonderful, with excellent views along the coast in both directions. I'd call Carn Liath one of the most satisfying brochs to visit o the Scottish mainland. Location: On the south east side of the A9, 3 miles north east of Golspie. Signposted, parking available across the road (north west side). Nearby accommodation is calculated 'as the crow flies' from Carn Liath Broch. 'Nearest' may involve a long drive up and down glens or, if you are near the coast, may include a ferry ride! Please check the property map to make sure the location is right for you.